All Malvern homes currently listed for sale in Malvern as of 04/21/2019 are shown below. You can change the search criteria at any time by pressing the 'Change Search' button below. If you have any questions or you would like more information about any Malvern homes for sale or other Malvern real estate, please contact us and one of our knowledgeable Malvern REALTORS® would be pleased to assist you. 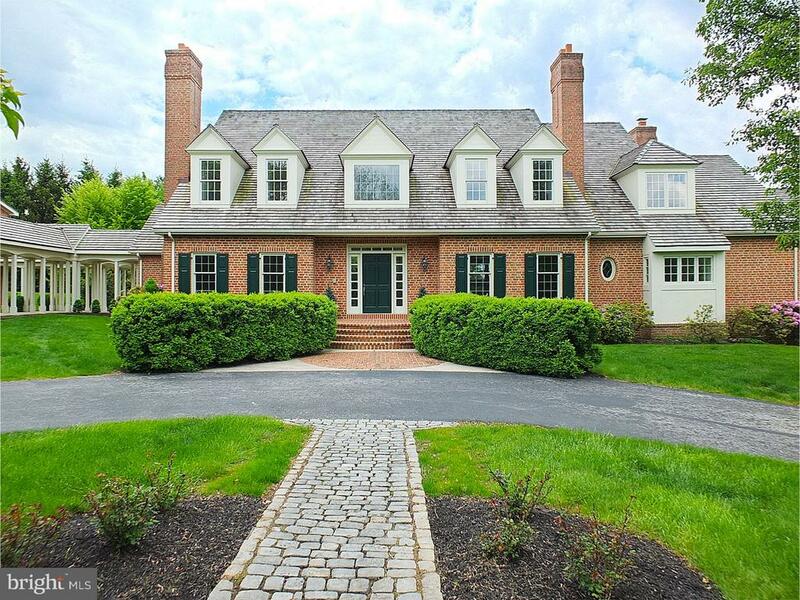 "Thru the Gated Entryway & up the winding drive is a Beauty of a Home that has become one of the Grand Dames of Main Line Living, sitting on 16.5 magnificent acres. No expense was spared in the Planning, Design & Finish of this Exceptional Luxury home, which spanned a 3 year construction period & for which the cost basis far exceeds the Offering Price. Appreciate the genius of R.A. Hoffman, who laboriously designed this Beauty & carefully sited her to greet the Morning Sun and wish the setting Sun Adieu. This Architectural Wonder flows gracefully with Subtle Angles and Fine Lines. Look up to the Roof, Coiffed with Cedar Shake which continues to flow beyond the Roofline and drapes the side walls & Covered Porches. PA dry laid & stacked Stone exterior walls give a feeling of strength and stability. The Court Yard like area houses three separate two car garages (total of 6 garages) one being attached to the main house & one having a second level that can easily be finished as a Guest Quarters. Designed to look like she was born at the Turn of a Previous Century, she exudes Fun and Youthfulness, and a Confidence that this feel will continue once you enter the Main Door. Step into the Stunning Entrance Hall and you can feel this Lovely Home Embrace and Welcome you! A Sampling of just some incredible appointments: Gorgeous Wood Inlay Floors, a Rarely seen Floating Spiral Staircase spanning 3 Levels, a Blend of Old World Charm w/ Rumford Style Fireplaces & Trim to modern conveniences w/Elevator to all 3 Floors, Advanced Energy Efficiency w/ multi zoned HVAC and Electronic Technology ( annual Heating & Cooling savings) as well as Heated Floors throughout,Solid Interior Cherry Doors & varied Wood Species Trim-Wainscoting & Mantle Finishes. This Masterpiece is designed for Entertaining w/a Flowing & Open Floor plan w/Exterior Porches, Expansive Inground Gunite Pool & Cabana & Extensive Landscaping & Waterfall. On the casual side is the Custom Kitchen w/ Hand Made Cabinetry "
"Little Valley Farm enjoys a secluded location offering uncompromising privacy. The restored and significantly expanded Chester County stone farmhouse was completed under the direction of renowned architect John Milner. It provides the perfect blend of historic understated charm, and all the needs and luxuries the most discerning owner can enjoy. Furthermore, the property includes a beautiful Chester County stone and frame bank barn, an oversized pool and spa with brick surroundings, and a 3-4 bedroom guest house. The main house boasts a well equipped country kitchen, open to a large breakfast porch and adjacent to an office with 3 built in desks. The kitchen overlooks the fmly room, complete with fireplace, wood paneling surround, built in cabinetry, and double glass French doors leading to a covered porch with expansive views of the grounds and ponds. Rounding out the main floor are the fmly and formal entries, pantry, formal dining room, 2nd office with powder room, formal living room and sun room. The gorgeous sun room, doubling as an entrance for the pool; includes a bar, seating area, book shelves, and provides the plant lover convenient indoor watering and growing opportunities. 5 Bedrooms, 4 full and 2 half baths. A highlight of the second floor is the ensuite master bedroom with a deck overlooking the valley view, and including a dressing area with 2 built in dressers and 2 walk in closets, and a full master bath with soaking tub and separate shower. Truly too much to fully describe in this all encompassing property. A series of ponds are fed by a branch of the Crum Creek. A perfect blend of wooded landscape provides privacy with plenty of open meadows all for fantastic light, views and tranquility. Willistown Township is known for its open space ethic and Little Valley Farm is no exception, yet the property is Convenient to Philadelphia, the Main Line, 202 business corridor, the Paoli R5 and Amtrak station under construction, PHL and Brandywine airports, "
"Sellers Say SELL! Spectacular Value-Could NOT be recreated at this Price! Impressive custom designed European Manor home in this sought after location in Willistown,sitting on almost six magnificent acres overlooking the 6th green and the 16th tee and fairway of White Manor Country Club's golf course.A wrought iron gated drive,Belgian block accents leads to this breathtaking estate with over 15,000 sq feet of exceptional living space bursting with luxury appointments and unparalleled craftsmanship.Every detail was thoughtfully designed to provide functional daily living as well as elegant entertaining on a grand scale.Features include a dramatic two-story Reception Hall with artisan made curved railings to the second floor and two centrally located formal Powder Rooms,an extraordinary Great Room with a magnificent raised fireplace, an antique Italian bar,a second floor Balcony on three sides designed to be an extension of the room for large gatherings,and a wall of floor-to-ceiling French doors with palladium windows that open to the fabulous Courtyard Terrace.Adjoining the Great Room is a formal Dining Room with an exquisite fireplace,a beautiful cherry Library with walls of built-ins, a Billiards Parlor, and a state-of-the-art gourmet Kitchen with attached fireside Breakfast Room which leads to an enclosed Sun Porch with striking stone walls and access to the side Terrace with trellis and built-in outdoor kitchenette.The expansive first floor Master Bedroom Suite with vaulted ceiling is equipped with every desirable amenity and features a signature palladium window in the bedroom precisely positioned to capture the sun rise in the summer.Located down a private hall on the first floor, there is a wonderful Guest Suite quarter with Sitting Room and a Bath.Four additional Bedrooms on the second floor are adjoined by Jack and Jill Bathrooms, and there is an additional Music Room or 7th Bedroom Suite with bath on the second level.Elevator runs from the Garage side of t"
"Elegant and exceptional, Hailand Farm is a sprawling Charlestown Township estate situated on 49+ picturesque acres of pastures, woods & rolling hills. Accessed by a winding driveway, this lovely Main Line property was built in 1836 & was originally owned by the Young family. With a brick walkway extending to the entrance, this 7-bedroom, 5.2-bathroom home features a center hall with a staircase & wood flooring. This space includes a large powder room with a mirrored-top vanity, a coat closet & access to the rear brick terrace & basement. To the right, the stylish living room has 2 fireplaces, and leads to the library with custom bookcases. Adjacent on the right is an airy garden room, with cathedral ceiling & sky lights, featuring a fireplace, terracotta floors & sliding doors opening to the deck. The copper-topped wet bar connects to the library. On the left is the dining room with built-in wood cabinetry, fireplace, wood floors & a window seat. It leads to the gourmet kitchen with exposed beams, herringbone floors, & center island with cooktop & seating, a desk and spiral stairs. Upscale appliances are Viking 4-burner gas range; SubZero refrigerator; Bosch dishwasher; double sink; InSinkErator disposal & Jenn-Air wall oven. Sliding doors provide terrace access with views of the swimming pool & gardens. Adjoining are: laundry room, mudroom, greenhouse & guest room with a cathedral ceiling & full bathroom, double vanity & mirrored closets. On the 2nd floor, the master suite showcases two fireplaces, carpeting, mirrored closets & his & her baths (with shower & soaking tub). The 2nd bedroom includes a fireplace. The hallway bath has a tub & shower. A 3rd bedroom has a spacious closet, while the second hall bath has a shower. This floor also has a gym. The third floor's two bedrooms feature closets & hall bathroom has a tub, a mini-fridge & breakfast bar. The unfinished basement has a bar, wine cellar & storage. With exterior stone walls, this estate also includes a po"
"Leaward, this charming right sized farm is in turn key condition and offers a recently renovated 4-5 bedroom house, a 7 stall barn, detached garage with storage and office space, and, almost 20 acres of gorgeous ground. Noted architect Warren Claytor designed extensive renovations to the 125 year old house which have just been completed. Warren was ever respectful of the architectural heritage and integrity of the house. The result is a turn key home offering all the benefits of new construction with breathtaking views over the almost 20 acres and surrounding properties, flexible living and entertaining spaces, and expansion opportunities. A few of the very special features include; on trend kitchen and baths, beautiful hard wood floors, millwork and hardware in keeping with a late 19th century farmhouse, new systems, and expansive flagstone patio overlooking propertyLocated in historic Willistown Township Chester County, 199 Line Road is in the Great Valley School District. The Main Line, and West Chester are minutes away. Center City Philadelphia, the Philadelphia International Airport, and connections to Routes 202, 1, 76, 476 and the Pennsylvania Turnpike are easily accessible." 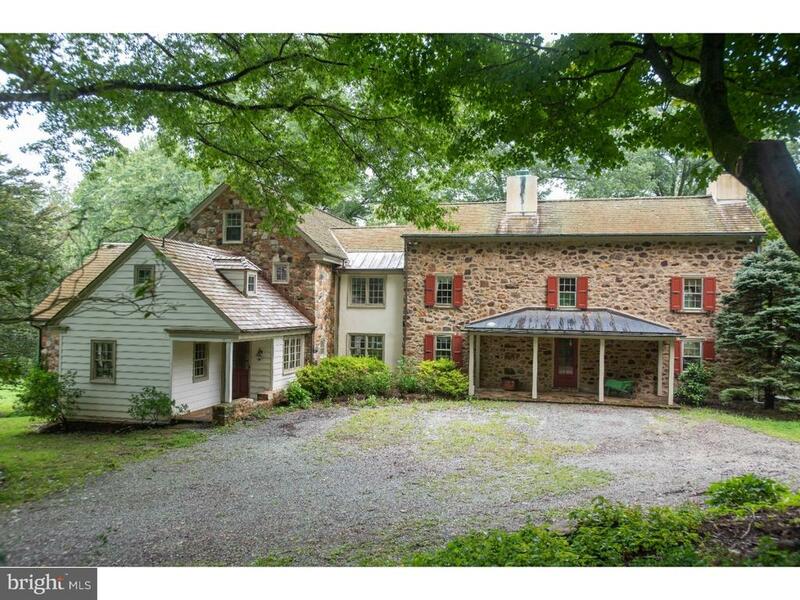 "Beautiful Chester County setting to build your dream home in the heart of Radnor Hunt country. The property is bordered by Ridley Creek and adjacent Ashbridge Preserve to the East. Magnificent estate properties join the property to the West. Your privacy and beauty of the surrounding countryside is preserved by Conservancy Agreements that protect this and surrounding properties from further development. The building site offers unobstructed sunrise and sunset views. The beauty of the setting has been captured in building plans prepared by Peter Zimmerman and complimentary landscape design by Carter van Dyke. These plans are available for inspection or bring your unique vision and designs to the property. Great opportunity to enjoy the country lifestyle with conveniences of big city amenities and the finest schools nearby. 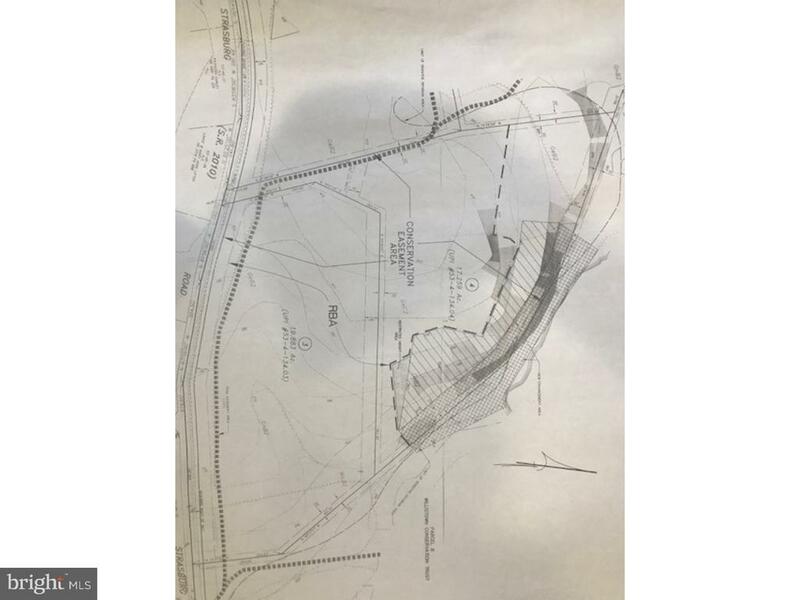 The property is comprised of two parcels (17.25 acres) and (19.80 acres)." "First time available in many decades! 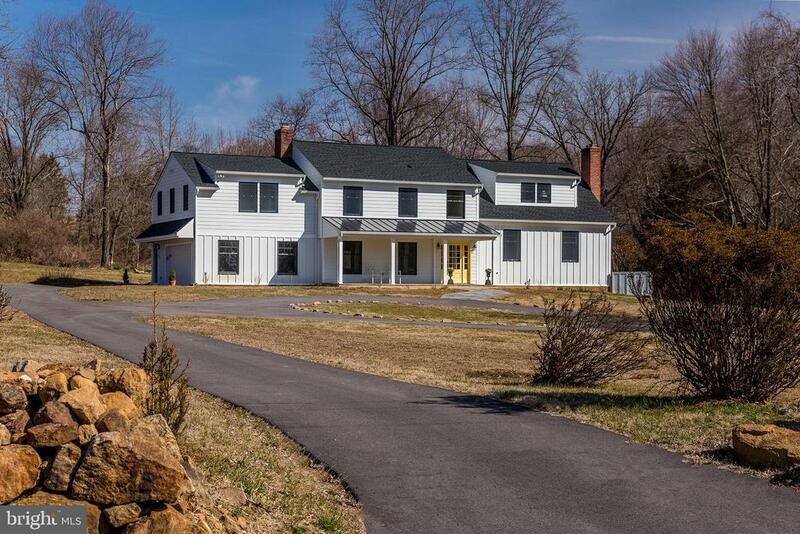 Quintessential Chester County stone farmhouse on 19 acres, across from Radnor Hunt Pony Club, and surrounded by other properties also under conservation easement, in the heart of the well known Willistown Township conservation area. Additional building options available per conservation easement. The Samuel Pennock House is circa 1740 and has had additions throughout the 19th and 20th centuries. The property boasts a 3 bedroom 2 and a half bath home with wide random width floor boards, walk-in fire place with welcome window, plus attached guest suite with 2 bedrooms and a bath. Updated kitchen with granite countertop, newer cabinets and stainless steel appliances. The two structures are connected by a glass enclosed plant conservatory with radiant heated brick floors. Enjoy all four seasons with space big enough for living, dining and gardening. Multi-level brick patios line the entire back of the house with southern exposure, views of pasture and pond, swimming pool with flag stone surround. Ideal for entertaining. Massive 1700s three story stone barn with multi car 1990s built heated collectors garage attached. Willistown Historic. Come experience Willistown Township countryside and yet have access to the Main Line, West Chester, PHL airport, R5 and Amtrak station. So much potential in an unbeatable location." "Welcome, equestrian enthusiasts and peaceful countryside seekers alike, to the estate of your dreams! This paradise is a combination of 3 parcels, totaling 92 +/- acres, with the ability to subdivide into 2 lots for investment opportunities or to create a family compound in accordance with the conservation easement. There are a total of 40 stalls on the property in several barns including an 11 stall courtyard style barn next to the main house and a 17 stall barn with an attached apartment, (2) shed rows and another 6-stall foaling barn. 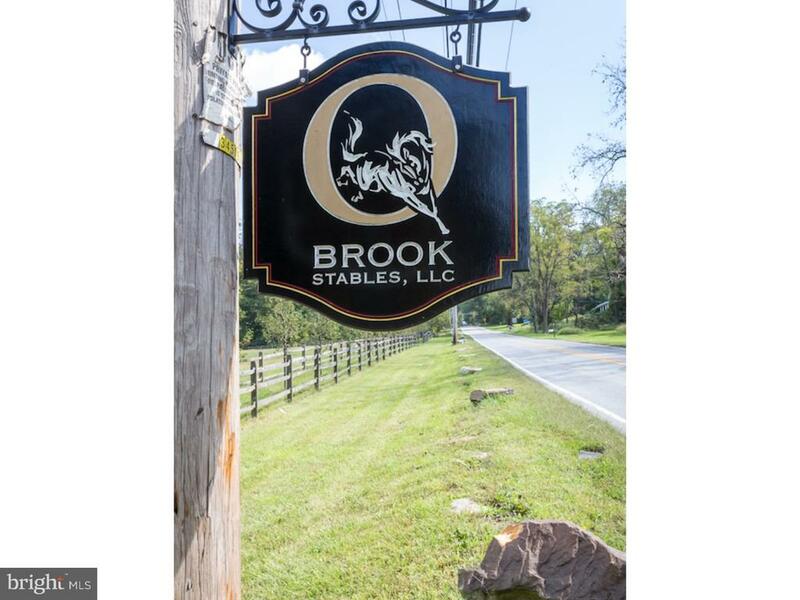 The conservation easement will allow for two additional homes, an indoor ring up to 20,000 square feet and expansion of the existing turn out ring adding value for someone looking to build a full property equestrian business. The main home itself offers a rural farm feel & secluded comfort, all while maintaining a close proximity to Philadelphia and access to New York and New Jersey. When driving down the long lane to the 298 year old home, you'll come out into the clearing where the fields, that feature new fencing, will unfold before your eyes. The front porch overlooks the expansive fields and offers a welcoming environment for a peaceful afternoon in a rocking chair or a cup of tea with a friend. This home, recently re-modeled with new windows, a modern kitchen, and HVAC, maintains the elegance of the 1700 build but offers the functionality of 2018. A home that welcomes hosting, you'll find both a sitting room for cocktail hour and a library for an evening book by the fire. The hardwood floors give way to the staircase and onto the formal dining room where class and style form a perfect union. From the center hall entrance through the spacious dining room with fireplace and original wide plank floors you pass through the butler pantry into the newly renovated kitchen. Off the kitchen is a less formal entertainment area, which offers wonderful views of the 11 stall stable and the rolling fields. The other end the house off the ce"
"Beautiful hand-crafted stone farmhouse is nestled on 4 private acres abutting trails of Valley Creek Nature Preserve, in a family neighborhood in desirable Tredyffrin Township. Stunning curbside appeal, complete privacy & gorgeous views are every homeowner~s delight. The custom designed 9474 sf (2000sf lower level) home is breathtaking from every aspect. Meticulously landscaped, the natural stone embraces the entire exterior highlighted w/keystone arches, flagstone patios, copper roofing, downspouts & gutters, stone chimneys & cedar shake roof. The brick paver walkway welcomes guests into the spacious foyer, brightened by a large triple window overlooking the rear property, one of the home~s many idyllic vistas. Architectural details include craftmanship millwork, antique random width heart pine floors, 3 fireplaces, French doors, cherry cabinetry, 9~ ceilings, and more. The many windows, doors & skylights offer a virtual panorama of the stunning property throughout the home. Enjoy casual elegance in the spacious living room(FP), dining room, den (FP), wide hallways & large foyer perfectly suited for formal entertaining & easy mingling. The French sliders to the flagstone patios enhance indoor/outdoor entertaining. More intimate gatherings are enjoyed in the open concept kitchen & dining nook w/French slider to a flagstone patio w/propane line for grilling. The gourmet kitchen is a cook~s dream w/SS appliances, Thermador gas cooktop, cherry cabinetry & granite tops for easy meal prep. From the kitchen island, be greeted with morning sunrises out the bay window while enjoying nature~s delights of the picturesque back yard. Spend memorable evenings in the large FR cozying up to the stone FP (wood burning) surrounded by custom cherry bookcases & bench seating. The rear bank of transom windows, French slider & skylights bring the outdoors in all year round & create a charming gathering spot for family. Radiant floor heating in the tiled sun room keeps it warm"
"Exciting opportunity to create a Custom Estate Home on one of only Five remaining parcels in the community of HIGHGROVE. Tucked within an extraordinarily beautiful natural setting, Highgrove's 70 acres estate is comprised of 17 residences unmatched in their sophistication, quality of build and architecture. Set within the award winning TE school district and just a mile to Valley forge National Park, the residences enjoy pivotal location on Philadelphia's Main Line, the 202 corridor and perpetually conserved farmlands of Chesterbrook. Parcels range in size from 2.31 to 5.78 offering largely flat open space ringed by centennial trees with the ability to accommodate swimming pools on all lots. The exemplary construction of MLP Builders and the quality oversight of ONeill Property Group combine for tailored building experience an one of a kind estate home. One time initial capital contribution fee for Buyers of $950." "Welcome home to this magnificent Custom-Built house, situated on 3.20 prime bucolic acres!! 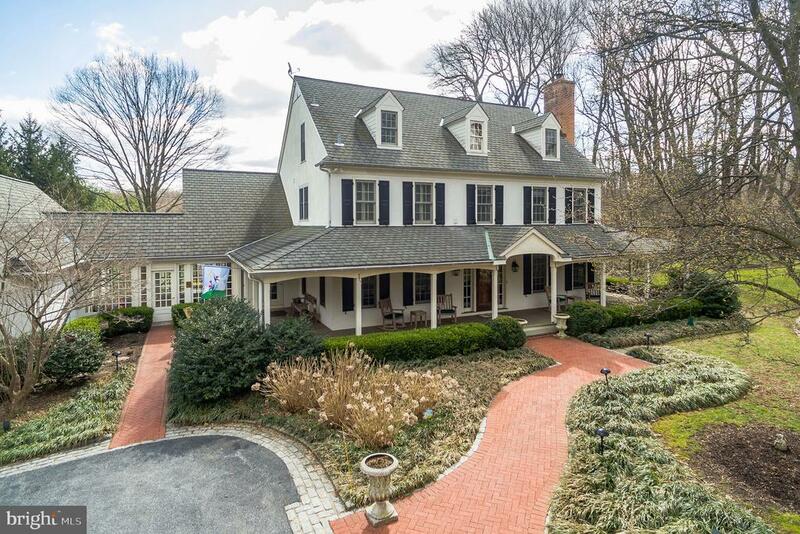 This 5 Bedroom/ 5.3 Bath Colonial presents impressive traditional features with captivating architectural details and a fluid floor plan for easy everyday living- with great style and elegance for entertaining guests! This timeless floor plan offers a Reception Hall, Living Rm with a cozy gas Fireplace, Dining Rm with Custom Millwork, and Butler's Pantry with a granite countertop,sink,and cabinets. A large gourmet Kitchen & Breakfast Rm with granite countertops, top of the line S.S appliances, Sub Zero Fridge, built-in desk, a wall of windows to gaze into the tranquil rear yard, and a door to the screened in Porch. The spacious Family Rm has vaulted ceilings, a gas Fireplace, and tray ceiling with cove lighting. The Main Level also includes a huge Home Office, Sunroom, 2 half baths, and a Mud Room. Gracing the Upper level is the Owner's Suite with 2 outfitted closets, a Sitting Area with columns and a bump out of windows that overlook the serene yard, and a Luxurious Bathroom with a dual sink vanity, soaking tub, tiled Spa shower, Sauna, and Water Closet. Two additional Bedroom Suites are also on this level ? each with outfitted closets & well-appointed full bathrooms, and a convenient laundry room with sink and storage cabinets. The third floor has a large bedroom, and room that can be used as an additional Bedroom or Family Room, and a Full Bath. The Finished Basement will not disappoint with a Built-in Bar, Storage Rm, Cedar Closet, Half Bath, Heated Tile Floors, and a gorgeous temperature controlled Wine Room with Humidor! Conveniently connected by a breezeway is the Multi-Generational Suite- perfect for in-laws or Au pair, with a Living Rm, Dining Rm, full Kitchen, full Bathroom, and Bedroom ? all with porcelain tile. The professionally landscaped grounds include a wrap around porch, new brick walkways, flagstone patio in the rear with a stone fireplace, pool with water"
"This 5 bedroom 4.5 bath with 4,200 - sq ft living area and 2 car attached garage is located on 4 acres in Willistown, Chester County Pa. The home sits in the heart of hundreds of acres of conservancy land. Picturesque windows throughout allows the beauty of the magnificent outdoor scenery to be enjoyed from every room in the house. The home was completely renovated in 2017. The renovations include all new heating, plumbing , electrical, roof, windows, insulation, drywall, Hardie broad siding, deck, front porch, circular drive, and refinished existing driveway. Additionally, a new 2 car garage with a mud room was built, as were 2 bedrooms and a bathroom on the second floor. The interior has also been totally remolded. The home now includes a cathedral entrance to the foyer, maple hardwood fl on the first floor, a new custom kitchen with quartz counter tops and Italian ceramic tile flooring. New custom bathrooms throughout. The lower level was also finished and has access to the side yard. This property is located 30 min from the Phila. Airport and 45 min. from downtown Phila"
"YOU'VE MADE IT - This elegant Top of the Mountain French Manor home in Tredyffrin Township, on a beautiful panoramic site in a secluded Valley Forge Mountain hill top location is nestled in nature - 6 acres with room to roam. There is NOTHING TO COMPARE to this homestead - truly for the discerning buyer. 'Extraordinaire': The rear secluded PARADISE features a free-form pool with Waterfall & Spa surrounded by EXTENSIVE hardscaping & now matured landscaping to this 6.3 Acre Mountaintop Retreat Estate (Stay-Cation). Many quality features coupled with sophisticated design create this unique One-of-a-Kind custom retreat that the finest of tastes will enjoy. Fairy tale like setting, with a circular driveway that leads you up to slated courtyard, with arched leaded glass doors in the light and airy open vestibule. Two story designer, gourmet French Country Kitchen with large travertine stone floors. Formal Living Room and elegant Dining Room (with Butler's Pantry) each with a fireplace, extensive molding and hardwood floors. Unrivaled owner's suite looking over the vast expanse of a home. Other bedrooms included in their own west wing. Significant expansive finished walk out basement. Improved Price, Improved Market, and Improved Condition since last on the market!" "Build your dream home in this sought after Tredyffrin location. Vaughan Building Company is proud to present this Classic stone exterior, with low maintenance fiber cement siding. This spacious open interior flows the way you want to live today, with 10 ft first floor ceilings and 9 foot second floor. An expansive Foyer greets you with an extra wide turned staircase and window seat, Living Room and a private Study with built-ins & window seat. Holiday sized Formal Dining Room with wainscoting and adjoining Butler's Pantry with wine fridge. Kountry Kraft Custom Kitchen with Huge Island, Quartz Countertops & Pro Appliances. Sun filled Morning Room with adjacent screened in porch. Wide plank site finished hardwood flooring and superb millwork. Spacious Family Room with gas fireplace, coffered ceiling and built in's. Master Suite with tray ceiling, and two huge walk in closets, spa-styled Master Bath with free standing tub, huge shower and marble vanities. Four additional generously sized bedrooms with walk in closets and charming sitting areas. Rear entrance with vestibule, coat closet, cubbies and large pantry. Elevator rough in for future installation. Gas heat, dual system HVAC with multiple zones, public water. Still time to design a custom home of your choosing. Photo's shown are of similar home built by Builder." "This stunning and sophisticated custom stone colonial, situated on a private 7.9 acre lot in Tredyffrin Township, offers an impressive exquisite design with meticulous attention to detail. Quality millwork, 10 foot ceilings, site-finished cherry floors, expansive windows & numerous architectural appointments abound through out this fabulous home. Grand Foyer with a stately extra wide staircase; Formal Living Room with coffered ceiling & beautiful fireplace; Study with magnificent cherry millwork; elegant Formal Dining Room with glass french doors leading to Butler's Pantry; state-of-the-art chef~s delight Gourmet Kitchen with Thermador stainless steel appliances, large granite island and extra tall gorgeous cabinetry; a striking two story sun drenched Morning Room with outside exit to slate patio; Family Room with spectacular floor to ceiling stone fireplace flanked by custom built-ins; formal and informal powder rooms, mudroom with second access to basement as well as the three car garage complete this level. Double doors lead to the lovely Master Bedroom with tray-ceiling, separate sitting area, & luxurious Master Bath; two Bedrooms both with private baths, two Bedrooms sharing a J&J bath, and ample sized laundry room round out the second floor. Walk-up unfinished third level offers multiple options, including great storage. The finished lower level is perfect for additional entertaining and offers a media area, custom wet bar with granite, exercise room, powder room, an expansive workroom plus outside exit to a private covered patio. This stunning home is part of a small, private community that offers convenient access to a myriad of shopping and dining, TE schools, corporate centers, Valley Forge Park, Paoli Hospital, and all major commuting routes. A must see for the most discriminating buyer!" "Welcome to this Outstanding Colonial Manor Home situated on a highly desirable 1.7 acre level lot on a cul-de-sac with breathtaking views of the pool and and beautiful fountain featured in the magnificent rear grounds of the property. Custom built by Drueding Builders, this desirable Cheswold model features four finished floors of living space, with additional space on the lower level to expand. Exterior features include stone facade, Hardy Board Siding, circular cobblestoned driveway, beautiful flagstone walkways and expanded patios with custom heated pool with rock waterfall, elegant water fountains, extensive professional landscaping with exterior lighting. Interior features include beautiful hardwood floors, three fireplaces, extensive custom millwork, arched entryways, Formal Living and Dining Rooms, gourmet Kitchen, an elegant master suite with sitting room and lavish master bath, finished third floor suite, and a spacious partially finished lower level. Custom details abound thruout to make this home the perfect place for entertaining and active family living. This central location is just minutes from 422 corporate centers, King of Prussia, Malvern, Paoli and Wayne for local shopping and dining and is within close proximity to all major roadways for commuting to Center City or the airport." "An impeccable top-to-bottom transformation exceeding a million dollars in renovations has brought forth the highest caliber home in the most superb location. This magnificent sprawling brick estate, fronted by a circular drive with entrance pillars, sits on a prime, peaceful lot stretching across 3 incredibly scenic wooded acres. Your family oasis is even more appealing with a fabulous in-ground swimming pool and patio where summer enjoyment will last for hours. Graciously-proportioned rooms are bathed in sunlight and reflect a transitional-style design complemented by the finest finishes, details and materials. The expansive open floorplan invites a seamless flow for entertaining and is balanced by wonderful intimate spaces for relaxed family living. Beautiful new wide-plank site-finished oak floors spilling through the main level and up to the bedrooms lend a rich touch of warmth. Hosting guests is the ultimate pleasure in the lovely living room with a fireplace and open chef's kitchen featuring white shaker cabinetry, Calcutta quartz countertops, a huge island and commercial-grade stainless steel Viking appliances. A formal dining room through French doors, breakfast room overlooking the pool, and adjacent family room with a fireplace, wet bar and large wine fridge make any occasion perfect and memorable. A second family room/sunroom with a vaulted sky-lit ceiling and double-sided brick fireplace showcases gorgeous greenery views through massive windows. A formal powder room off the dining room is convenient for your guests, and a mudroom accessed by the 3-car garage presents a family powder room. The second level is a comfortable haven with 5 generously-sized bedroom suites, several outdoor decks & a new laundry room. The deluxe master suite with its own handcrafted staircase entry offers a huge vaulted sky-lit bedroom with a wood-burning fireplace and sitting area where you can savor the views through picture windows. A custom-outfitted master dressing room c"
"Boasting nearly 70 acres of green pasture and woodlands, this impressive lot sits adjacent to Hailand Farm. This open, yet private lot offers plenty of opportunity and is convenient to schools and major commuting routes such as the PA Turnpike, Route 202, with easy access to King of Prussia and Philadelphia." "A classic all brick Williamsburg colonial, in the prestigious Four Oaks area of Charlestown Township. Situated on four manicured acres with sweeping views, this pristine home affords an excellent backdrop for garden parties or fireside gatherings. The soaring two story center hall entrance, with marble floor, sets the stage for the grand staircase as your eyes follows the light from the floor to ceiling windows. The open floor plan allows those in the kitchen to converse with those in the atrium and the family room. The first floor master bedroom, with tray ceiling and marble fireplace, has access to the expansive terraces overlooking the lush vistas. The master bath has a marble floor, Jacuzzi, bidet, large stall shower and fabulous fitted closet. An all white kitchen, featuring all new appliances and custom Gobel cabinetry with glass display doors, flows into the two story atrium with Palladian-topped window wall. The two story family room is highlighted by a dramatic California fireplace with raised granite hearth. The second floor will not disappoint. An extensive interior balcony is accessible from the 4 bedrooms and two baths, and benefits from the abundant sunlight that pours in from the Atrium. The basement has a finished office. The huge lower level, with veranda door to patio, awaits your finishing touch. The two garages are attached to the house by a colonnade, second to none. The three car garage has storage above. But the piece de resistance is the 10 car bank garage that will make the most particular car collector weep with desire. This 2700 Sq. Ft. garage has been built to commercial parking lot specifications of 50 Lbs./Sq. ft., the second floor overhead door 11 x 8 for vehicle access. And for the horse owner or lover, this home is surrounded by hacking trails and horse farms . There is so much more, contact the listing agent for the list." 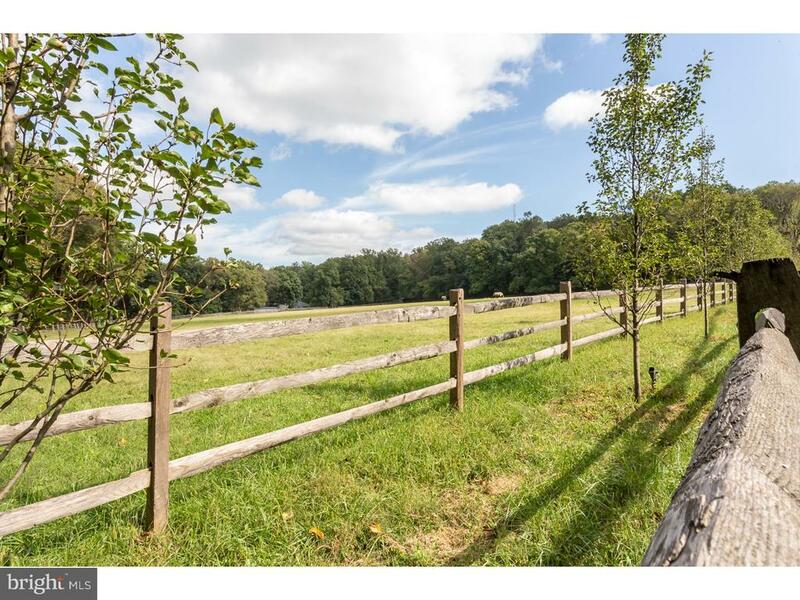 "Exceptional Chester County farm on pastoral acres that is perfect for the equestrian lover or entertainment. The circa 1812 farmhouse has been restored and expanded with a perfect blending of the Old World details, and new modern luxuries while maintaining the architectural integrity making it suitable for today's lifestyles. A new cedar roof with Canadian #1 Royals with a 6.5 exposure and heavy-duty copper valleys and flashing has just been installed. Living Room with fireplace and raised panel walls, spacious dining room, modern Chefs Kitchen and granite island, huge great room with fireplace bar and French doors to stone patio and arbor, enclosed porch with exposed stone wall and brick floor. Upstairs; the incredible master suite includes a dressing room, large bedroom with vaulted ceiling & fireplace and a spa bath. The 3rd floor is finished with a full bath. Outside is a classic stone bank barn with stalls, tack room and a rec room with a fireplace. There are garages and out buildings for the car collector and paddocks and access to trails for the horse lover. Three Ponds Farm is close to the Great Valley Corporate Center, PA Turnpike, Route 202 and King of Prussia but in a country environment making this the perfect location. This property has unusually low taxes." "Welcome to 375 Applebrook Dr, an elegant carriage home situated on the 18th fairway of Gil Hanse Designed, Applebrook Golf Course. Fall in love with .12 acres of landscaped lot set back beautifully from the street for privacy offering great curb appeal, with wonderful views from the stunning, southern exposure terrace overlooking the Applebrook Golf Club. This home is the only Kincraig model available on the course. Step inside through the stately foyer to find espresso hardwood floors, decorative custom millwork/molding and high-end wall coverings that showcase the attention to detail & custom features this wonderful home has to offer. To the left is the lovely living room with walls of windows. French doors lead to the regal in-home office with beautiful built-in book cases. To the right of the foyer find the grand dining room decorated with beautiful chair rail and plenty of natural light shining through the oversized front window. Continuing on through the butler~s pantry with full china closet and wet bar leads to the gourmet chef~s kitchen offering gas cooking, sleek paneled fridge and dishwasher matching the plentiful cabinetry, granite counters, and large island equipped with room for 4 bar stools as well as a breakfast room surrounded by windows, the perfect place to enjoy a cup of coffee to start the day! Continuing on to the family room, the focal point is the gas fireplace with mantle flanked by French doors leading to the outdoor flagstone patio terrace with awning overlooking the golf course and clubhouse, perfect for relaxing after a round of golf! The main level is complete with a laundry room with rear access to the oversized two car garage offering storage and workshop area, multiple closets for more storage, and a powder room. Walk up the lacquered finish staircase to the second floor that offers three-four bedrooms or office/bonus room depending on preference. The master suite with vaulted ceilings is spacious & offers his & her walk-in clo"
"Location! Location! Location!! Don't make an offer in Willistown, Radnor Hunt Country until you've seen this amazing home! Four (4) beautiful country-setting acres at the end of a private, protected, small and quiet cul-de-sac. 15 acre preserved land sits directly behind this property. Crum Creek flows through the northern corner of this estate. 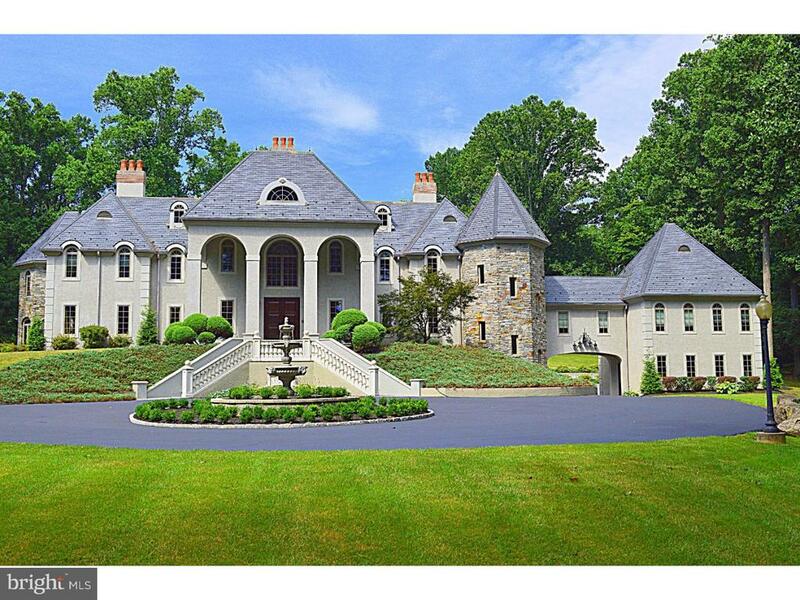 You have one of the most beautiful and entertaining properties just off the Mainline in Chester County. This home features 5+ bedrooms, 3 full baths and 2 half baths. 3 car garage/726 sq.ft attached, plumbed for 2nd floor apartment. Two private, large, bedroom suites. Hardwood floors throughout, huge and open granite kitchen area Bosch stainless steel appliances with wine cooler. Newer bathrooms. This home has it all, screened in room overlooking the pool (salination system), front porch, 3 fireplaces & a wood-burning stove. 3 zone HVAC, tons of storage, generator and gym for your private workout. Stucco is certified by Willistown Twp. This home has been designed by well known local architect renovated and expanded. Centrally located to both the best of public and private schools (Episcopal Prep, Villa Maria and Malvern Prep) Easy access to Malvern/Paoli trains. Great Restaurants and shopping. 25 minutes to Philadelphia Airport. Additional Remarks: This property is listed in public records as 20 Sugarbrook Rd." "The home you have been waiting for is finally here? Introducing Cedar Run, Malvern's most anticipated new community with only 9 lots remaining! All home sites all slightly over one acre. Surrounded by the bucolic Charlestown landscape, Cedar Run offers the perfect combination of privacy and convenience, located just minutes to 202 and the PA Turnpike. Premier architect Mark Stanish has personally designed all five floor plans which can be tailored to a buyers specification or a custom home can be designed. Each home is finely crafted by Hellings Builders, known for their quality construction and attention to detail with a reputation for honesty, integrity and high standards. 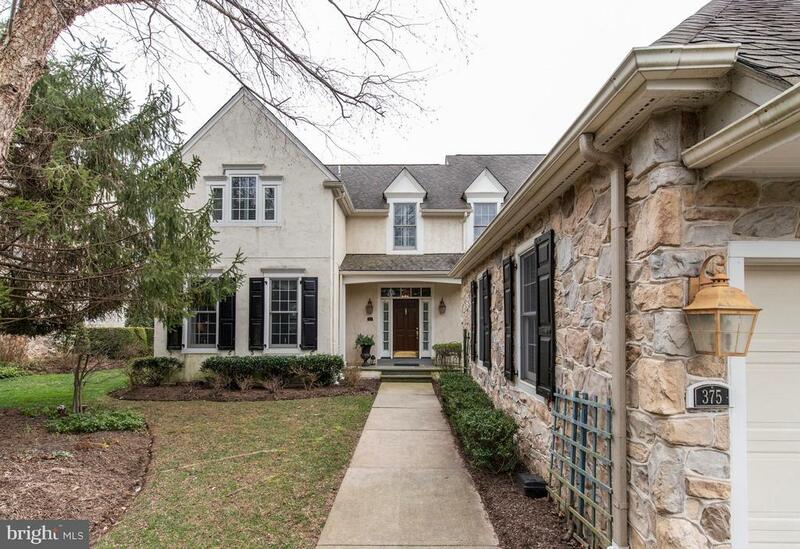 This 5 bedroom, 4.2 bath Haverford Model offers a bright, open floor plan, cozy family room, first floor office, morning room, finished basement, abundance of windows, luxurious master suite, site finished hardwood flooring, high efficiency hvac, and so much more! From the Hardiplank fiber cement siding, Pella Proline wood windows and Schlage interior door hardware, to the Aker soaking tub and Luxart faucets, no expense is spared and no corners are cut! This stunning home offers understated luxury throughout. Lot premiums may apply. Please note that photos are of a similar Haverford model but may include upgrades or finishes that are not offered in this home."